South Australia lit up the distributed energy map yesterday with word that it will build the world’s biggest virtual power plant and a separate, sizable commercial solar microgrid. The 250-MW virtual power plant, which will use Tesla Powerwalls, will encompass 50,000 homes at full build-out in four years. The homes will be networked via software to act as a single, centrally controlled resource. When the homes produce more energy than they need, the power will be available for dispatch onto the grid. The project is three times the size of all other virtual power plants combined around the world, according to Danny Price, managing director of research firm Frontier Economics. Backed by a AUD$2 million grant and an AUD$30 million government loan, the virtual power plant will lower participant’s electricity bills by 30 percent, according to government estimates. The virtual power plant will be privately owned and operated. The government plans to issue a notice later this week seeking a retailer to deliver the program, with an eye toward enhancing the competitive market. The project is expected to create more than 500 jobs, including 250 related to installation of the Tesla batteries. Tesla plans to establish a service hub in a suburb of Adelaide, South Australia’s capital. The hub may expand to service Tesla products throughout Asia-Pacific. “This is a booming global industry and we want as many jobs in this sector as possible created here in South Australia,” said Tom Koutsantonis, South Australia’s energy minister. More than 1,000 public housing properties will receive, at no charge, the first 5-kW solar panels and 5 kW/13.5 kWh Powerwall 2 batteries, plus a smart meter. The systems will be financed through the sale of electricity. Following the initial trial, the solar plus storage systems will be installed on 24,000 additional public housing properties. The government plans to open the program to the general public in 2019. South Australia has already begun taking registrations from households and has received 6,500 applications. No decision has been made yet by the government on how it will prioritize applicants. 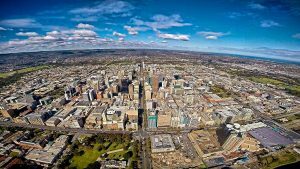 If public interest exceeds government expectations, South Australia may enlarge the virtual power plant. The virtual power plant will provide backup power to the households during an outage, but not for the duration a microgrid would. The virtual power plant can only offer backup as long as the batteries retain their charge. 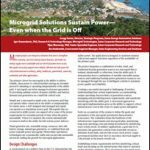 In contrast, a microgrid relies on islanded generators to supply power, which continues as long as fuel is available. South Australia also announced on Sunday that a 2.5 MW microgrid will be built at the South Australian Produce Market. The Pooraka facility trades more than 250,000 tons of fresh produce annually. The microgrid is being built to assure reliable energy so that refrigeration operates even during grid outages to keep the food fresh. Grid connected, it will sell surplus power to the central grid. The $10.5 million project will include 1,600 solar panels with a 2.5 MW capacity, a 4.2 MWh lithium-ion battery and a 2.5 MW generator. The project is expected to reduce electricity costs for the businesses by AUD$5.5 million over 10 years, when compared to current retail power costs. The project will receive a AUD$2.5 million government grant. The government is describing the microgrid as the largest private solar PV system in South Australia. The system will supply all of the wholesale market’s energy needs and will also feed surplus power into the broader grid, relieving peak demand and putting downward pressure on power prices for all South Australians. The control system for the site is being developed by local South Australian company AZZO. 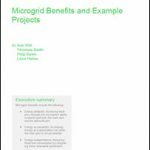 The microgrid will be fully operational by late 2018 and will create about 40 jobs during construction. The microgrid is expected to cut greenhouse gases by 2,637 tons.